Master of ceremonies and CSUN Distinguished Alumnus Bill Griffeth starts CSUN's 2018 Distinguished Alumni Awards. Photo by Lee Choo. 2018 Distinguished Alumnus Richard Foos delivers his acceptance speech. Photo by Lee Choo. 2018 Distinguished Alumna Janet Garufis delivers her acceptance speech. Photo by David J. Hawkins. 2018 Distinguished Alumnus The Hon. D. Zeke Zeidler delivers his acceptance speech. Photo by Lee Choo. 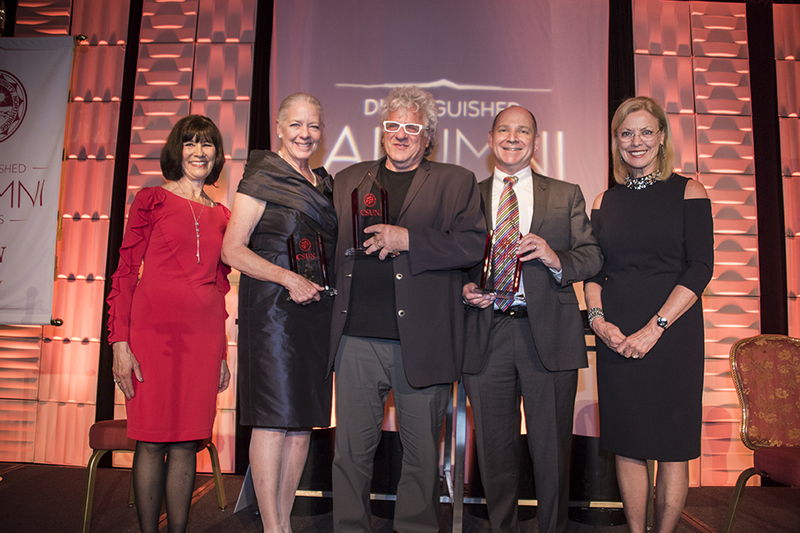 California State University, Northridge’s 2018 Distinguished Alumni Award recipients have reached the pinnacle of three diverse industries — entertainment, banking and law. Though their careers are varied, they share an innate leadership ability and extraordinary commitment to serving others. 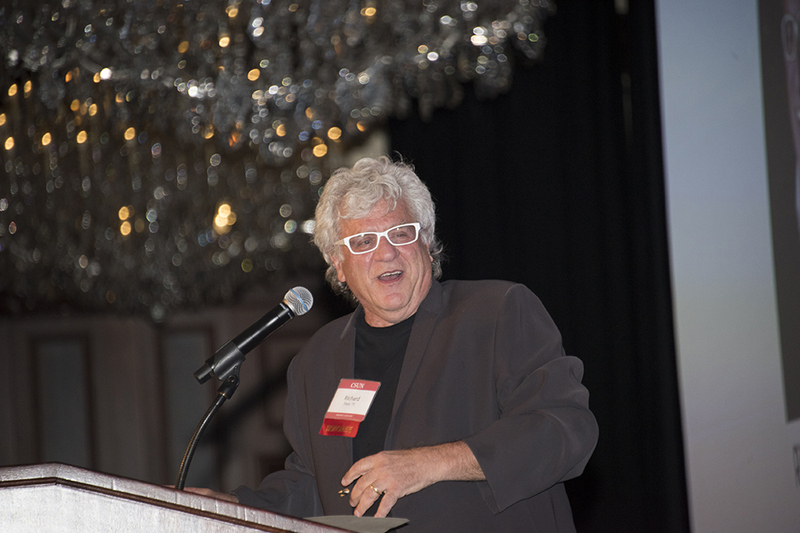 Richard Foos ’71 (Sociology) — the co-founder of the iconic Rhino Records and Shout! Factory, Janet Garufis ’77, M.A. ’02 (English) — the groundbreaking chairman and CEO of Montecito Bank & Trust, and The Hon. 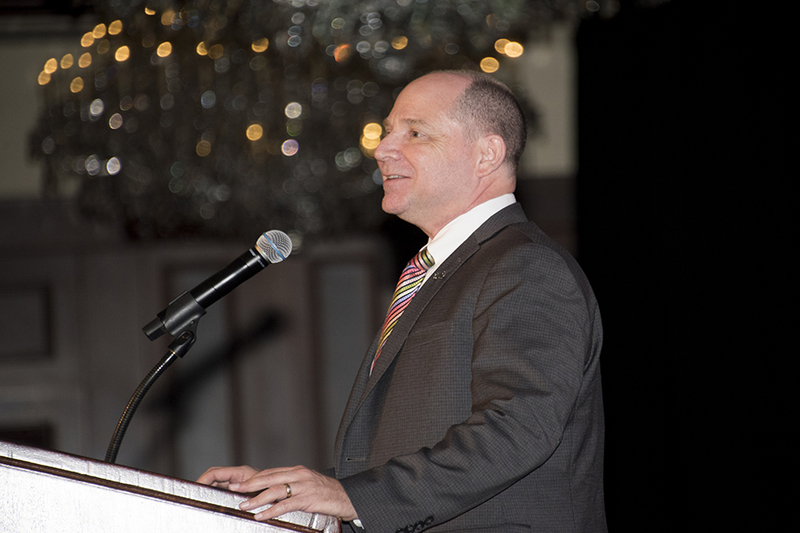 D. Zeke Zeidler ’87 (English-Literature) — the Los Angeles Superior Court Judge and LGBT trailblazer made up a dynamic Distinguished Alumni class that were honored Saturday, April 21. “Our honorees tonight have led courageous lives and all possess uncommon intelligence, persistence and brilliance. 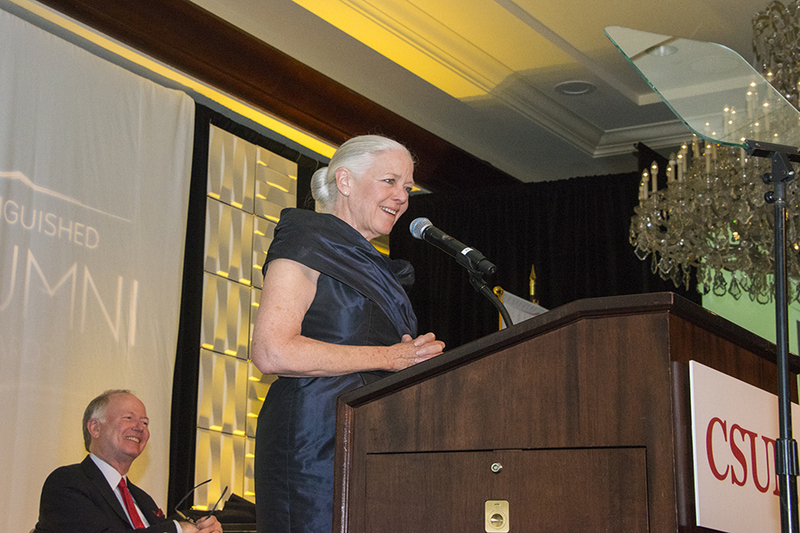 But it is their giving spirit that moves me and inspires me,” said CSUN President Dianne F. Harrison. In his acceptance speech, Foos shared that he was disillusioned with his educational environment before he arrived at CSUN. 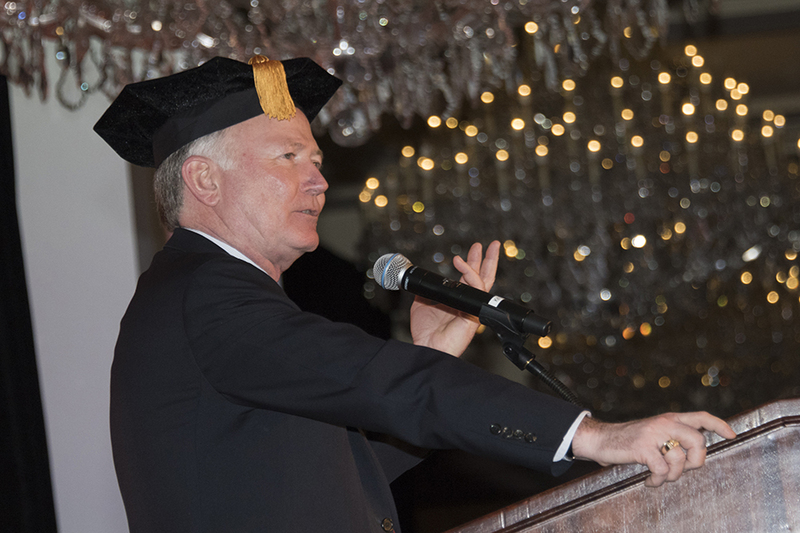 “I decided to transfer to a school of the people,” he said, referring to CSUN, which was met with thunderous applause from the packed room of CSUN alumni and friends and family of the honorees. Foos spoke of how CSUN gave him a freedom to explore and of the acceptance and encouragement he received from CSUN faculty. Foos was already on a road to making special things happen. He started the Free Store in South Central Los Angeles before arriving on campus ­— a place where he collected used clothing and household items to give to people in need. CSUN elevated his social consciousness and personal drive to do more. Foos started Rhino Records in Westwood, and he developed it, with his business partner Harold Bronson, into a record label that created a reissue boom in the music industry. After selling the label to Time Warner in 1998, his next act was reviving cult films and timeless television series at Shout! Factory. Garufis also started from humble beginnings and created a new paradigm, doing so in the banking industry. Beginning her career as a teller for Security Pacific Bank, she climbed the ladder at industry giant Bank of America and created new small business lending practices that are commonplace today. Her pioneering efforts have made her one of the most influential female banking executives in California. It was initially her goal to become an English professor, and she took steps toward becoming one when she returned to CSUN to earn a master’s degree. But her path led her back to banking as chairman and CEO of Montecito Bank & Trust, where she currently oversees more than $1.4 billion in assets across the company’s 11 branches in Ventura and Santa Barbara Counties. Garufis reflected on how the success of her fellow CSUN Distinguished Alumni and other Matadors can positively influence and motivate CSUN’s nearly 40,000 students. Garufis’ fellow CSUN College of Humanities graduate was the final honoree to take the stage. Zeidler is a former CSUN Associated Students president (1984-85) and held the position with conviction and bravery as one of the first openly gay presidents on a U.S. university campus. Zeidler fought for the rights of gays and lesbians, as well as for the social and political rights of others while on campus. His time at CSUN helped launch him into a career where he defended the rights of children and families — first as an attorney, then as a juvenile court referee and now as a three-term Superior Court Judge. During Zeidler’s speech, he spoke about his time as a student and the people and events that shaped him. He spoke of how the Lesbian Gay Alliance group used to meet in a back room at the University Student Union. “Now, on this campus, who could ever imagine in the middle of the Student Union would be the incredible Pride Center,” Zeidler said. Zeidler spoke of his commitment to former foster youth through CSUN’s Resilient Scholars Program, to which he and his husband Jay Kohorn give both financial and personal support. “Former foster youth overcome incredible barriers, and they are defying horrifying statistics just by being on a university campus,” Zeidler said. Zeidler had a large and enthusiastic group of guests for the evening. He closed his speech by explaining why. Each spring, CSUN honors its distinguished alumni, drawn from a base that numbers more than 350,000.